The Beverage Holder Accessory from ErgoVerse gives GIGCHR users a convenient way of keeping a beverage up off the floor and within easy reach. 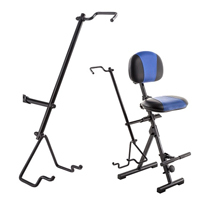 This accessory can also be used on the MVMNT Foldable Perching Saddle Seat and the FYLDST Foldable Leaning Stool. Note: Installation of the Beverage Holder Accessory requires the purchase of the Double Adapter Accessory Mount (GPS-ACC-90007) which can accommodate two separate accessories. 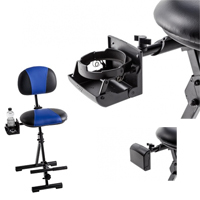 The Double Adapter Accessory Mount from ErgoVers provides GIGCHR users with a means of mounting either one or two of the available Guitar Stand and Beverage Holder accessories. 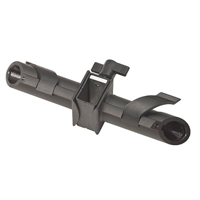 This adapter can also be used on the MVMNT Foldable Perching Saddle Seat and the FYLDST Foldable Leaning Stool. The Guitar Stand Accessory from EgoVerse provides GIGCHR users with a convenient way of keeping their guitar safely supported without the requirement of a separate guitar stand. This accessory can also be used on the MVMNT Foldable Perching Saddle Seatr and the FYLDST Foldable Leaning Stool. Note: Installation of the Guitar Stand Accessory requires the purchase of the Double Adapter Accessory Mount (GPS-ACC-90007) which can accommodate two separate accessories. Sacro-Ease Seat Supports from McCarty's Sacroease were initially designed over 70 years ago to "rebuild" the support that is lost as seat cushioning and supporting structures age. They also serve well to improve the functionality of low cost office chairs or uncomfortable mass transit seating. Built to outlast and outperform other available solutions, all models of the Sacro-Ease Seat Supports feature the same foundation that has always set them apart from other available options. A 1/8" thick by 1" wide steel band frames the seat. Over this frame is stretched a wide rubber band that serves to absorb vibration when travelling over rough terrain or to provide a cushioning resistance when sitting on seats that are no longer as supportive as they once were. The steel frame is bendable which permits users to customize for optimum comfort. As a "Seat Only" model, the RX Cutout Seat is designed for chairs that offer good back support but lack a comfortable seat. 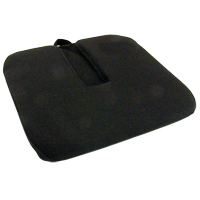 This modified seat is padded with a 1" thick layer of firm poly foam and features a 2.5" wide x 9" deep "foam-free" Coccyx cutout that provides pressure relief for those suffering from tailbone injuries or other conditions that generate similar sensitivity to pressure. The 15" W x 16" D seat will fit the majority of chairs or vehicle seats. As with other Sacro-Ease models, this Coccyx cutout version includes the primary steel base and rubber band structure with a cover of high quality durable upholstery. The underside of the seat features a durable, non-skid bottom that keeps the Sacro-Ease firmly in place on all seats. A convenient handle facilitates transport between locations. It is stocked in the standard 15" seat width but is also available by Special Order in a 12" width that works with narrower bucket seats or a 19" width for bench seats or larger users. Deeper seats are also available by Special Order.